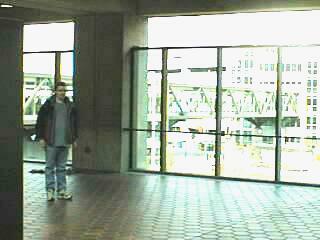 My son, Brad, in the entrance area of the Springfield/Franconia Metro Station. 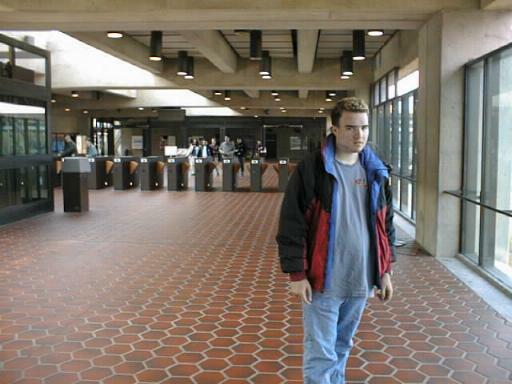 The ticket readers, Brad Lathan on the right, at Springfield Va. Metro Station. 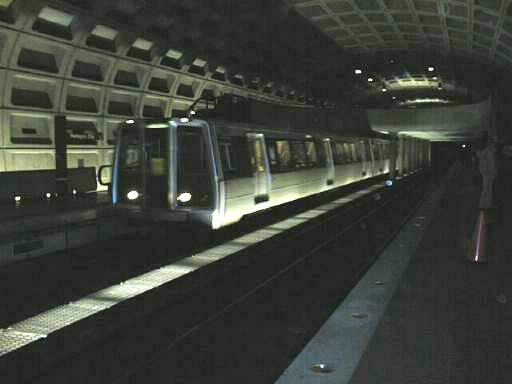 This is one of a number of above ground stations. It has two parking lots availabel. The one on the grounds of the station fills early but there is more parking at the huge shopping mall parking lot across from the station. A shuttle bus takes riders back and forth between the lots. This station like most of the above ground stations has both a covered area and an open area on the platform. In bad weather you can wait under cover and in nice weather you can get some sun if you wish. The interior of the cars is always clean. They are well heated and airconditioned. They also have nice comfy seats. Although this car appears empty (less complaints if someone doesn't like having their picture taken) they can be rather crowded. 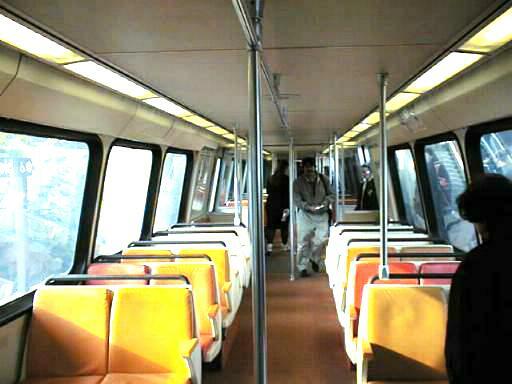 Also, it is common to see both uniformed and plain clothes police on board. See the Afro-American guy in the wind jacket?? He was/is a cop. I've seen him on other trains in uniform. It is a fairly safe place. There are emergency phones on both ends of all cars just in case. This is the interior of an underground station... After all, it is a subway system :-) They are much brighter than what this looks. They have both elevators and escalators. 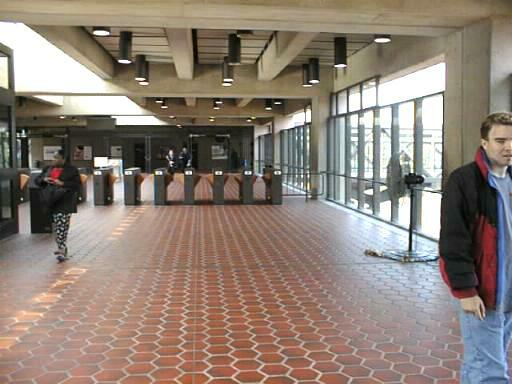 There is an extensive security system including hidden metal detectors in some stations, security cameras, roving police both in uniform and in plain clothes like the man in the other picture. This is another underground station. You can see the "train approaching lights" in the floor along the edge of the platform and you might be able to see the "gravel effect" on the edge of the platform. These aid hearing and sight impaired persons to see the train coming and know where the edge of the platform is. 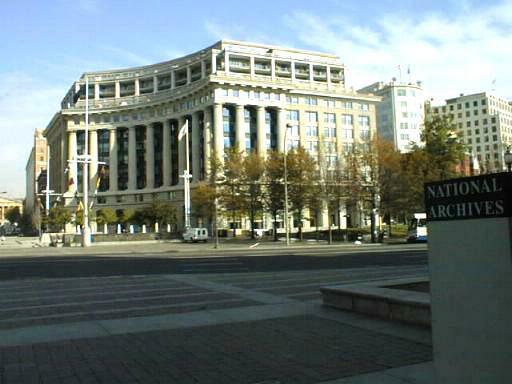 This shows the North front (where researchers enter) of the National Archives building as seen from the Navy Memorial. This is the nearest subway station. Any closer and you'd be inside a research room. Almost a "no-brainer" to get from the subburbs to the Archives, right? 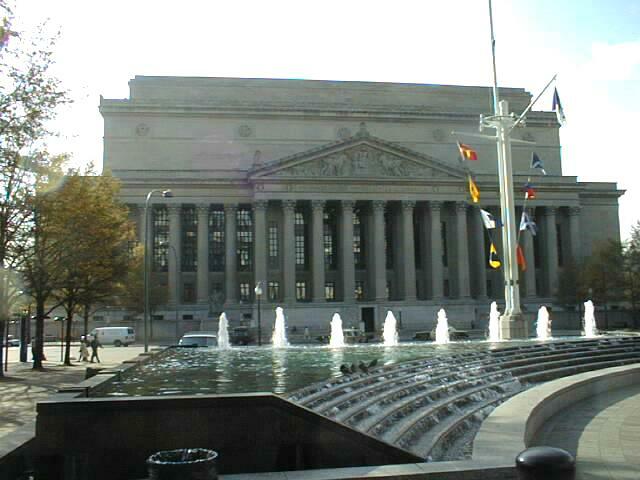 This is a view from the researcher's entrance of the National Archives looking back toward the Navy Memorial and the subway station. If one looks closely they can see a white van parked on the plaza. 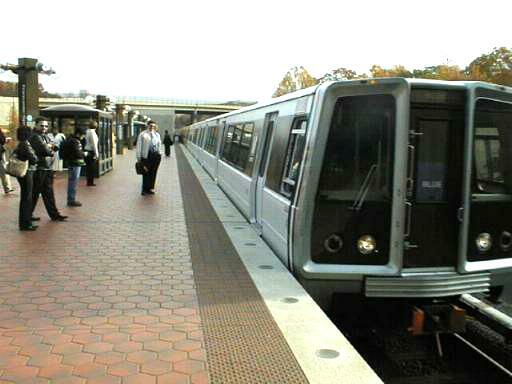 It is a metro repair truck with a worker fixing an escalator. The escalators are just to the right of the truck and the elevator is hidden by the National Archives sign just in front of me. The National Archives is a treasure trove. However, it is crowded. 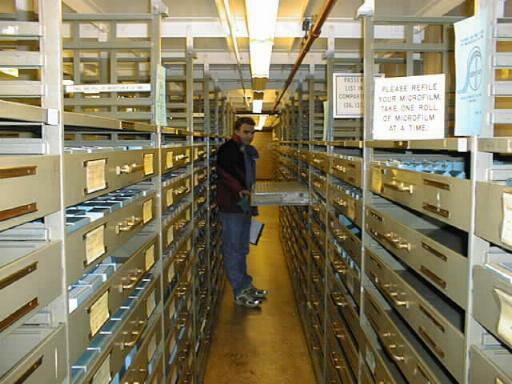 This area no longer is open to the public and these microfilms have been moved to an easier to get to place. These seemingly endless corridors filled with row after row of national treasures remind me of the scene in Indiana Jones and the Temple of Doom where the guy is putting the Arc of the Covenant away with millions of other identical boxes. Trust me, they can find it if they have it! 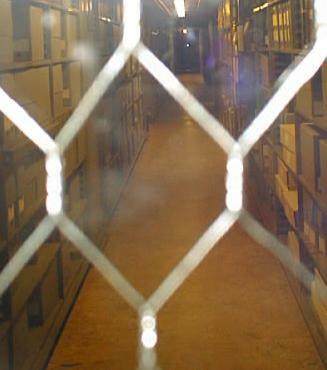 This is a view through an armored door of the "stacks" where documents are stored. As you will see in Pic00013 I got lucky and got a better picture. A young lady I see regularly saw me standing at the window in the door. Rules say: Absolutely NO PHOTOGRAPHY in the stacks. Well she knows me and trusted me. What they fear is theft, fire and now terrorism. I told her I'd turn the flash off and demonstrated in a safe direction. She opened the door. I've never treated her, as yet, to the coffee I promised but I'll see her again and pay up. This is Room 200. 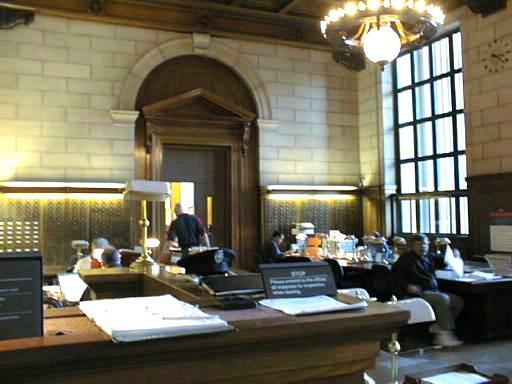 This reading room is where researchers go to see original documents. Yes, any citizen willing to go through the screening process to get a researcher's card can see the "real thing" in most cases. Some documents are of such general interest, like census docs., that they are not allowed to be seen in the original. They'd wear out from over use. However, most docs. may be requested and will be brought to this room. You may NOT bring most outside personal articles into this room: No personal pens, pencils, paper, books, coats, hats, etc. Laptops are permitted after being check in. Pencils and paper are furnished free. Copies may be made of most docs., with permission and a prepaid card bought downstairs. No kids, clean hands. Some researchers even wear white cotton gloves. 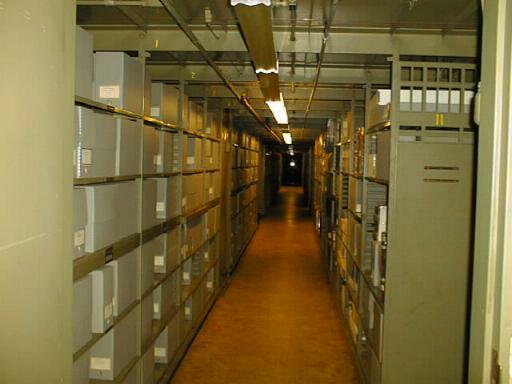 This is Room 400 of the National Archives. 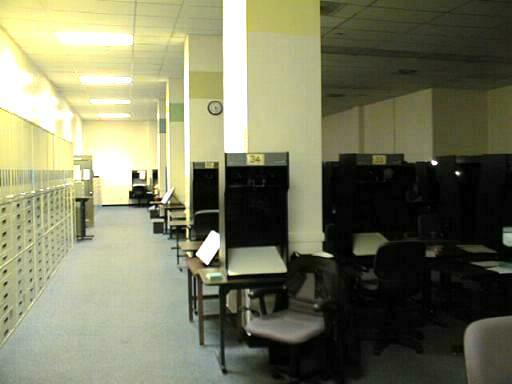 This is the microfilm reader room. Most researchers will start their work in this room. 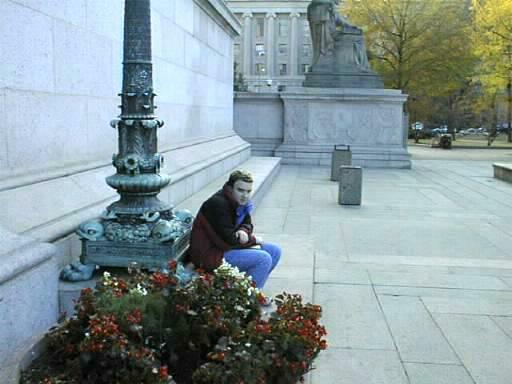 In spite of the flowers in the foreground this is a picture of a very chilly Brad Lathan sitting in front of the National Archives. Study The Past. 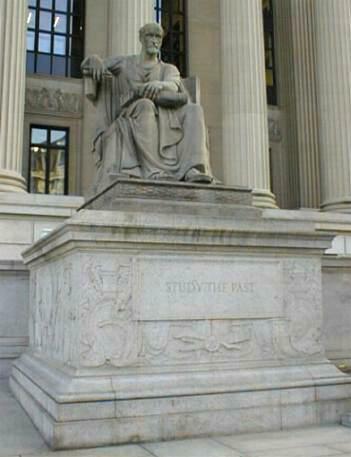 The reason this place and the Library of Congress exist is so that we can study the past. 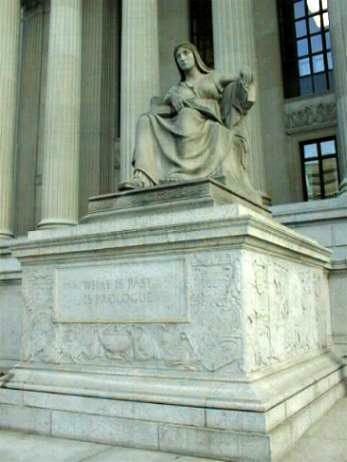 The archive and the Library of Congress are not just for genealogist nor were the created with genealogy in mind. In stead, they were created so that our leaders would have a source of information about our country's past to study in the hope that they wouldn't repeat past mistakes. What Is Past Is Prologue. I use this as part of my "signature file" in my email. Sorry about this rather bad photo. 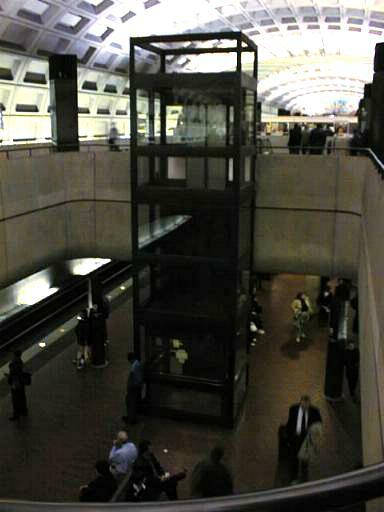 There are two groups of elevators and escalators in stations. Outside and inside. The inside take you from the ticket plaza to the trains and the outside takes you from the street to the ticke plaza. 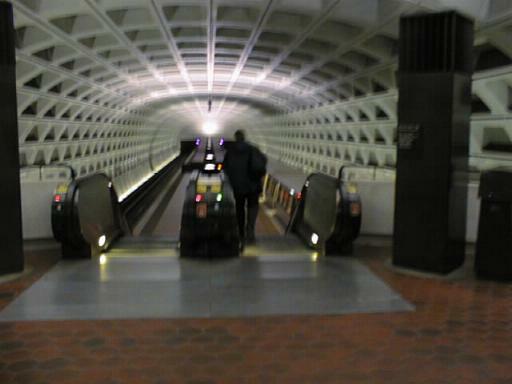 This is the top of an escalator in Metro Center Subway Station. At this point several lines, designated by colors, cross. To accomplish this the station has two track levels and a total of three levels including the ticket plaza. You are looking down from the ticket lobby onto the upper track level. In the distance you can see a cross tunnel. 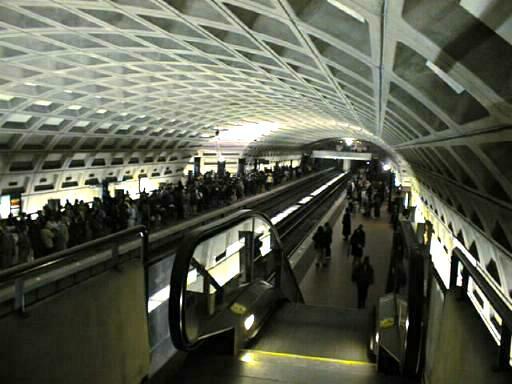 The other, lower track, goes along that tunnel and accessed by more elevators and escalators. This is nearly rush-hour and you can see the large number of folk waiting on the platform to the left. 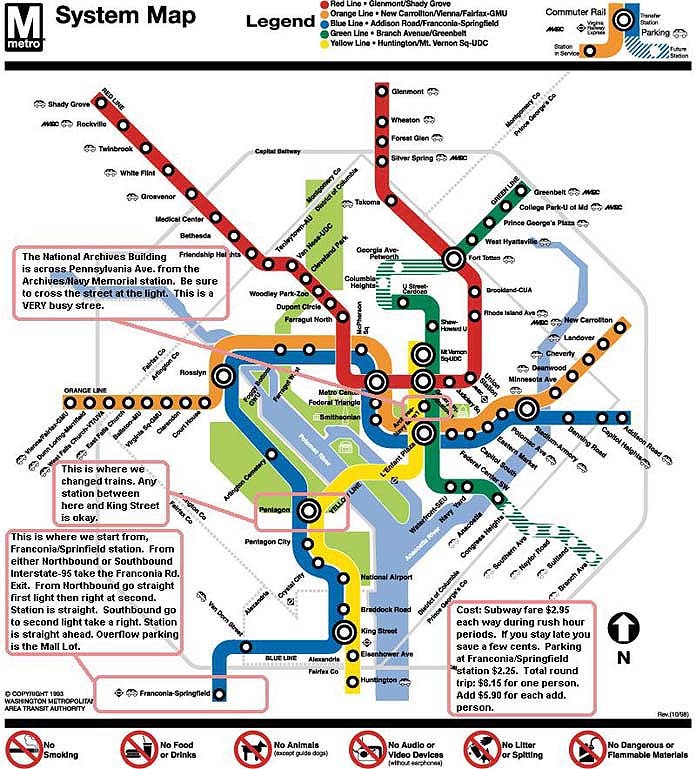 This is a map of the D.C. subway system (Metro). It is a large file due to the size of the map and multitude of colors. I have put some notes on the map showing what stations we used on this trip and what we did at each place.